← WHAT KEEPS KINDNESS AWAY? 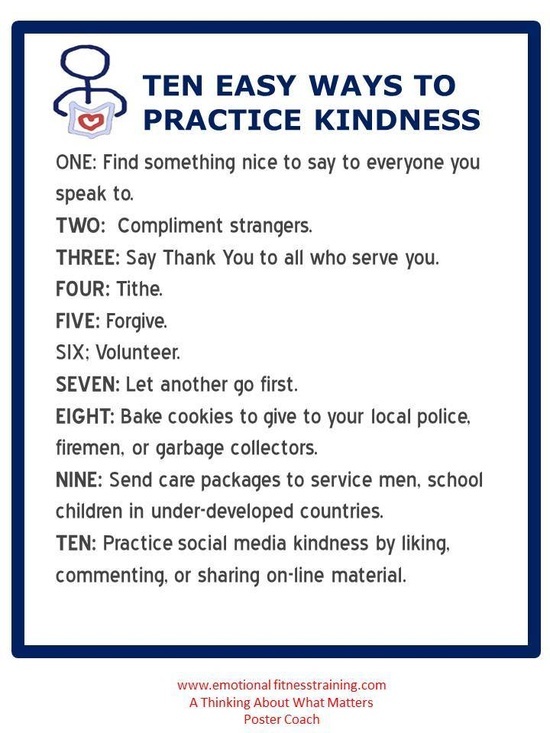 This post offers ten teaching kindness tips in the form of a Poster Coach. Kindness is a major path for strengthening yours and your children’s emotional fitness. Cruelty is part of human nature or there would have been peace on earth since the beginning of time. Still, every individual act of kindness matters. The receiver is nourished, but so is the giver. Teaching this to your children moves the world toward peace and puts them on the path to the good life. This entry was posted in Parenting Issues and tagged A poster coach, Emotional fitness, Emotional Health, how to parent, parenting, Parenting advice, postaday, Teaching Kindness to Children, Ten Kindness Tips. Bookmark the permalink.